This article is about the blocks in Super Mario 3D World. For the switches appearing throughout the Mario franchise, also known as Switch Blocks, see P Switch. Switch Blocks are a type of block similar in appearance to ! Blocks from previous games, appearing in Super Mario 3D World. 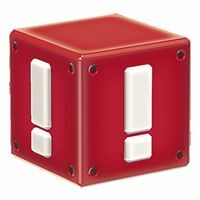 Similar to the ON/OFF Switches in Super Mario World, Switch Blocks, when hit, usually change the direction of Switchboard tracks in stages they appear in. Switch Blocks appear in three stages: Switchboard Falls, Cosmic Cannon Cluster, and Honeycomb Starway. The one in Honeycomb Starway reveals a platform when hit. ↑ Super Mario 3D World Prima Official Game Guide page 20. This page was last edited on June 7, 2018, at 14:06.